Announcing: Couture Weddings Event! | Entire Productions, Inc.
We are honored to be a part of a very elite group of wedding professionals called "Couture Weddings" and we're holding a launch party on May 11. Please take a look, and attend if you're able. We'll have DJ Tommy Fullove spinning tunes at the event! See you there! 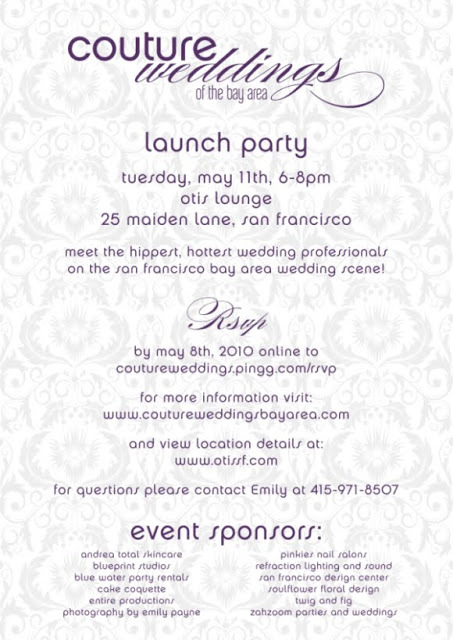 Enjoy a complimentary cocktail while you mix and mingle with the hippest, hottest wedding professionals on the San Francisco bay area wedding scene! Whether you are recently engaged or helping your best friend plan their big event. Come by for a cocktail and get to know the trendsetters in the wedding industry in a comfortable, lounge setting. Engaged couples and their supporters welcome!